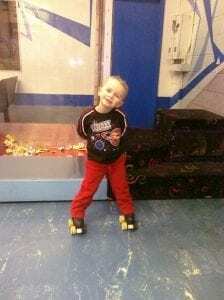 What age is best to learn to roller skate? We get this question all the time at Sk8world of Portage from people of all ages. Summed up in one sentence is this (and then we’ll go into details): If you can walk forwards and backwards with balance you can roller skate. Now let’s delve into a few details. Roller skating is a sport of balance, on one foot or another and switching from one foot to another. Unless you are standing still you aren’t often on both feet at the exact same time. If you have a 2 year old that is running around the house, most likely they are ready to learn to roller skate. See if they can walk backwards and make a game of standing on one foot or the other. Children this young are so easy to teach, they are like little sponges and love new challenges! Using fun methods like ‘marching’ on their roller skates they can be rolling forwards in minutes usually with a big smile on their cute faces! If you didn’t learn to skate as a child, there is still hope for you! Many adults are fearful of trying to learn to roller skate because of the danger of falling down. One of the first things we teach our adults to is how to not only fall but how to get back up! Wearing wrist guards is a good idea while you are a beginner and yes, there’s no guarantee that you will not fall but taking our classes on Sundays at Sk8world of Portage can certainly lessen the likelihood as you will learn all the important skills including stopping and how to maintain balance. Roller skating is a wonderful exercise for any adult, even beginners. You will use 80% of your bodies muscles and burn up to 650 calories per hour, not to mention the wonderful music and new friends you will make. Seniors seem to fall into two categories, those that have roller skated earlier in their lives and those that never learned. You do not forget how to roller skate but you do have find your new balance point. Remember that every 10 pounds lost or gained will affect your point of balance. Roller skating is a great low impact workout and gentle on joints, more so than running and bicycling. Again, taking our classes makes sure you learn or re-learn the sport in the correct way and you are bound to love the friends you make! The American Heart Association endorses roller skating as a heart healthy activity and we have seniors in their 80’s and even 90’s roller skating! So, what is the best age to learn to roller skate? Any age is best! Hope to see you rolling in soon to Sk8world of Portage Indiana for family affordable fun and keep rolling!